Want to watch a few GSD videos? You can see many videos here of German Shepherd Dogs doing all sorts of things - playing, working, singing, wrestling, eating, etc. Feel free to view as many of these as you'd like. After all, this is the place to come to see videos specifically about the German Shepherd dog on the Web, right? Most of these Dog videos may be found scattered elsewhere throughout this site, but we've included them all here for your viewing convenience. Some of these videos are very large and may take a few minutes to load, so please be patient. Find news, training, recreational activities, how-to videos and more - it's all coming here very soon. We hope to include lots of information that will be helpful to all German Shepherd Dog owners. So enjoy, read on, watch, listen and try to learn all that you can. And if you'd like to, please feel free to share these videos with your friends or family or anyone that loves dogs and the German Shepherd in particular. We do feel that there are loads of people out there that would love to watch these German Shepherd Dog videos too so we encourage you, if you find something here that you like, then please feel free to share it with your friends and family because chances are that they would like to enjoy it too. 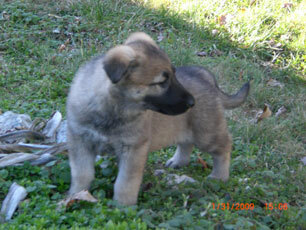 As far as things go right now, we will add more new German Shepherd videos as time permits. That is a definite. Enjoy and have fun watching all our German Shepherd videos below and thanks for visiting. Fussy German Shepherd "Tells It Like It Is"